Trying local cuisines is always a pleasure and one of the must-dos. When the trip gets longer, sometimes you miss foods you are more familiar with than the local foods. Nase Maso, a hamburger and steak restaurant near the city center of Prague, is here for you to serve you nice and familiar foods with unique atmosphere. Nase Maso is located not far from Palladium and Powder tower, and you might not easily notice if you don't look carefully as the restaurant is quite small. 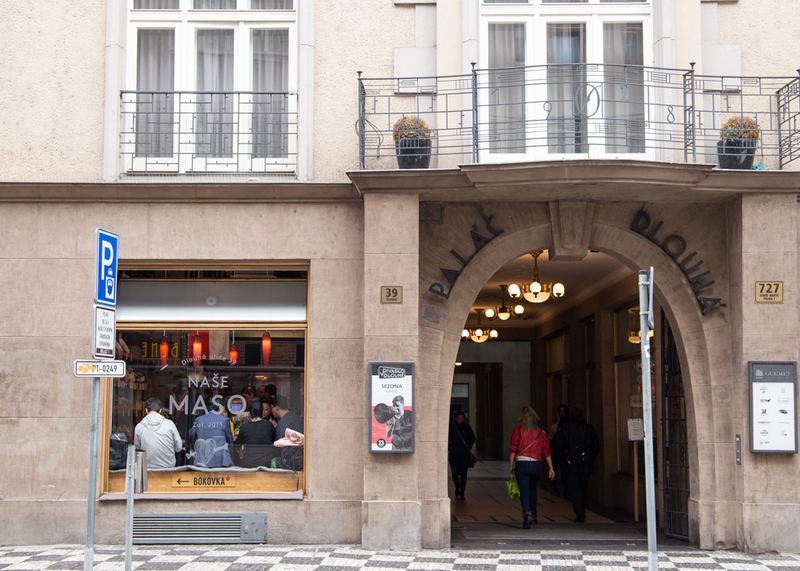 Nase Maso is one of the hottest restaurants in Prague not only among locals but also worldwide travelers. Inside the restaurant is just like a butcher shop. Nase Maso is actually a butcher shop you can buy high-quality meats, sausages, and hams. Many locals visit here mostly to buy meats to cook at home. 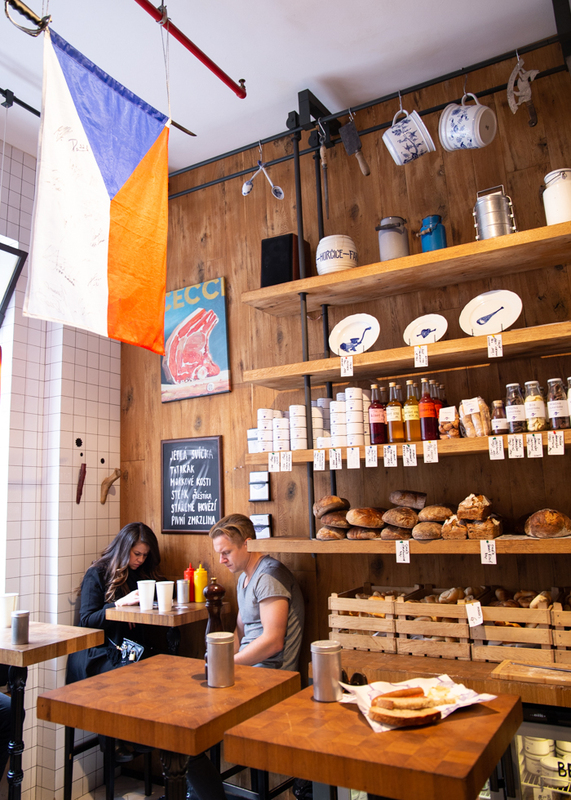 The concept and atmosphere are more unique than other modern or hip restaurant. 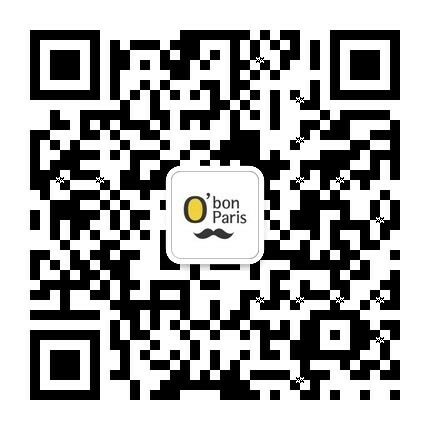 This will be a one and only and unique experience to try hamburgers or steaks at a butcher shop. 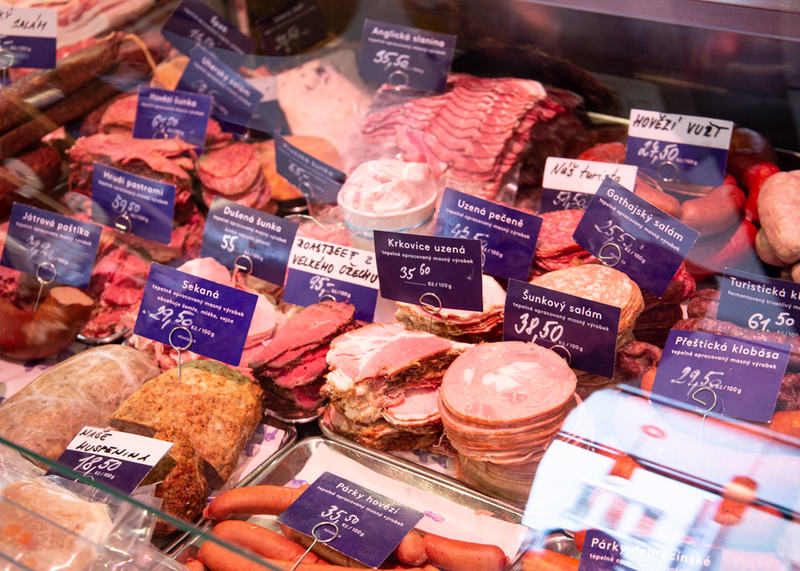 There are various types of meats, sausages and hams. 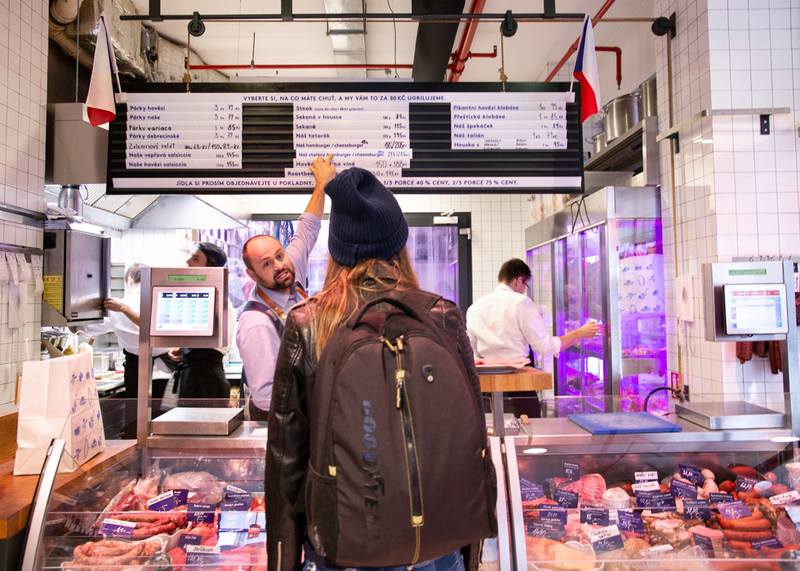 If you are staying at residence hotels or Airbnb with equipped kitchen, you can simply buy meats here and enjoy them more comfortably at your hotel. There are around 6 small tables. 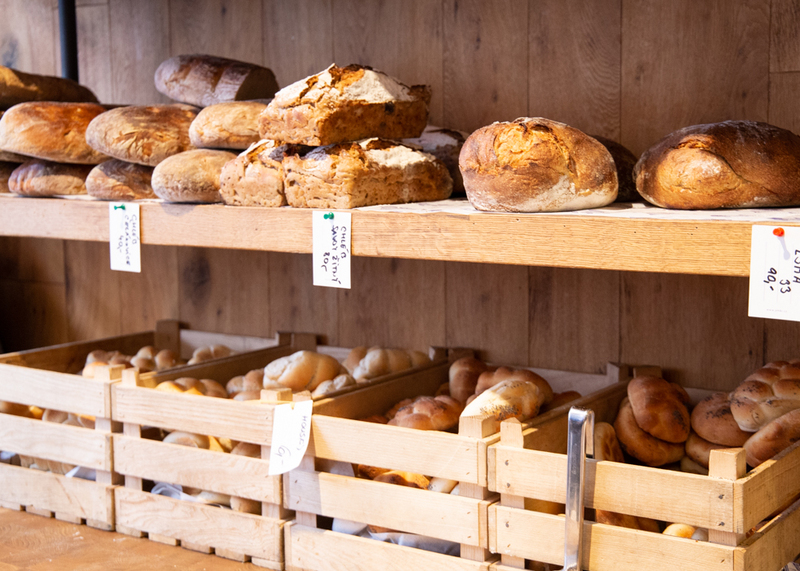 If you are planning to have a meal inside the shop, we recommend you to visit here a bit earlier than lunch or dinner time or a bit later. You can order what you want at the cashier and they will give you a small paper with order number. As they start to cook when they get an order, it takes some time to be served. The most famous and popular menu is a hamburger but steaks and sausages are also popular. 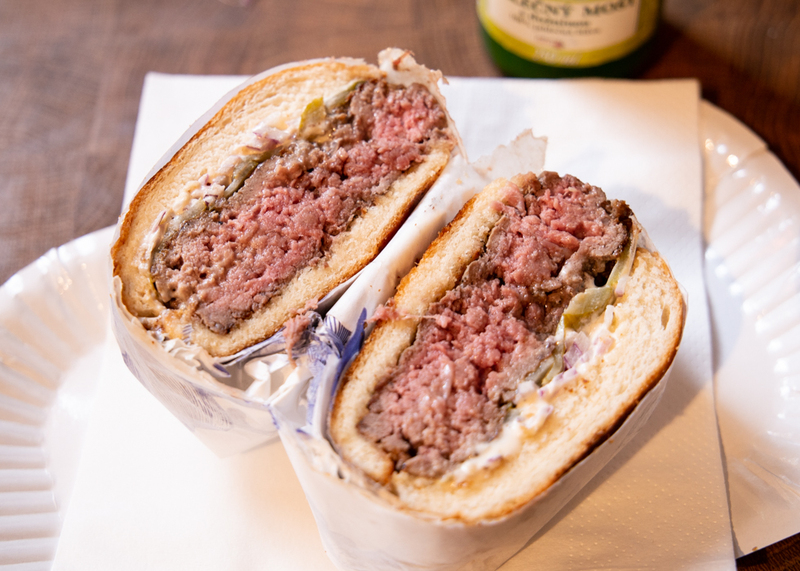 'Our dry aged hamburger' is the most popular menu of Nase Maso. When you first see it, you might feel that it is quite a small quantity, but don't be disappointed yet by the size! Once you start to eat, you will realize that the quantity is quite enough with the thick patty and abundant ingredients in it. The hamburger is served cut in two pieces. If you are visiting with your friend, one hamburger and a steak or a sausage will be a perfect choice to share. It looks like a normal burger, but the taste is beyond your expectation. The patty is fresh and soft melting in your mouth right away while buns grilled with butter are crispy. Pickles and vegetables balance the taste perfectly. 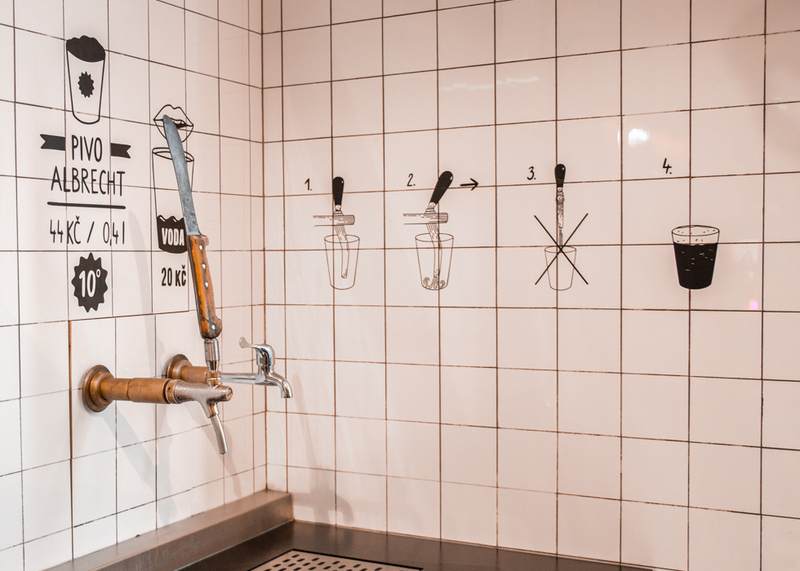 You can also order a draft beer here. You can get a glass after you order and help yourself. After trying Czech foods like goulash soup and pork knuckles, when you miss some other types of foods, this is the food to try. 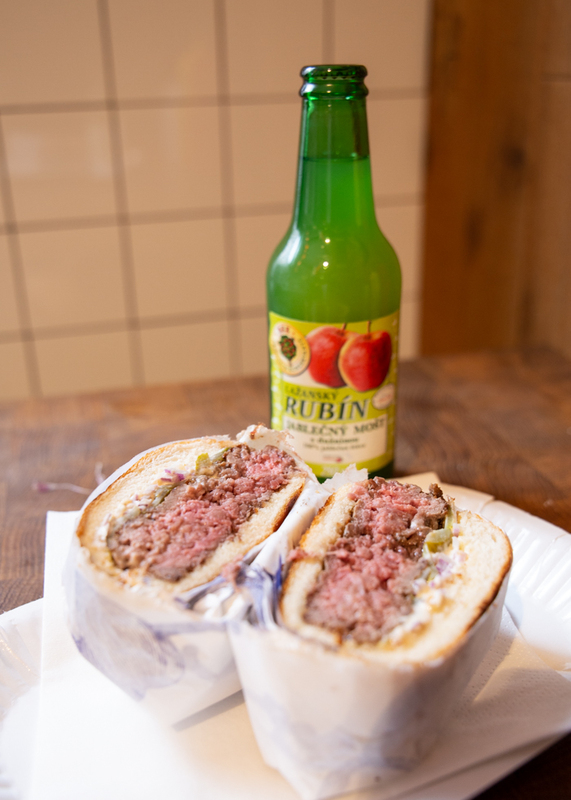 You can try hamburgers easily anywhere in the world, but it's not a common chance to enjoy a hamburger at a butcher shop.